Voting has finished at the General Congress, or Congresso, of the Oratorian confederation in Rome. We are very pleased that Fr Felix Selden of the Vienna Oratory, who visited us in May and has long been a friend of our community, has been re-elected as Apostolic Visitor. Congratulations to Fr Mario Avilés of the Pharr Oratory, who was elected Procurator General. 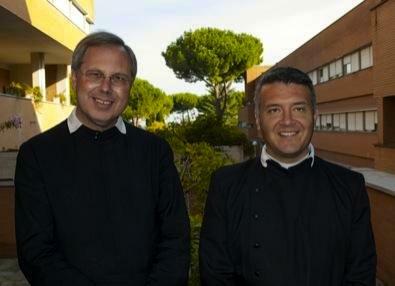 Here he is (right) pictured with Fr Felix (left). The new Postulator General, who promotes the causes of Oratorian saints is now Fr Mauro De Gioia of the Genoa Oratory. Fr Mauro is another good friend of our community, and sang the High Mass here on his last visit to Oxford. Here he is (fourth from the left) with Fr Felix, Fr Mario and the representatives from each region. For more information, see the Confederation website.